Nicholas Lardy, Author of, The State Strikes Back, and Senior Fellow at the Peterson Institute for International Economics. China’s extraordinarily rapid economic growth since 1978, driven by market-oriented reforms, has set world records and continued unabated, despite predictions of an inevitable slowdown. Scholar Nicholas R. Lardy argues that China’s future growth prospects could be equally bright but are shadowed by the specter of resurgent state dominance, which has begun to diminish the vital role of the market and private firms in China’s economy. Nicholas R. Lardy, Anthony M. Solomon Senior Fellow at the Peterson Institute for International Economics. He joined the Institute in March 2003 from the Brookings Institution, where he was a senior fellow from 1995 until 2003. He was the director of the Henry M. Jackson School of International Studies at the University of Washington from 1991 to 1995. From 1997 through the spring of 2000, he was also the Frederick Frank Adjunct Professor of International Trade and Finance at the Yale University School of Management. 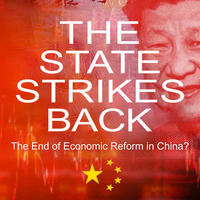 He is author, coauthor, or editor of numerous books, including Markets Over Mao: The Rise of Private Business in China (2014), Sustaining China’s Economic Growth After the Global Financial Crisis (2012), and The Future of China’s Exchange Rate Policy (2009). Lardy is a member of the Council on Foreign Relations and of the editorial boards of Asia Policy and the China Review. Co-sponsored by the John Sloan Dickey Center for International Understanding and the Political Economy Project.